Samuel Scheidt worked as a court and church musician in his native town of Halle—also Handel’s birthplace. 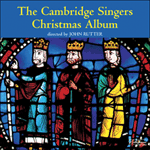 In dulci iubilo, a festive and splendid Venetian-style double-choir motet with two florid trumpet parts, comes from the composer’s first published collection, the Cantiones Sacrae Octo Vocum of 1620. You are Alpha and Omega!